Success With Baby Chicks was at the top of my chicken reading list for 2011, but I was a bit disappointed by the contents. Robert Plamondon compiled a lot of information from old poultry-keeping documents and mixed in a bit of his own experience, which sounds like a recipe for success, but I found the book dry and lacking in the information I was really looking for. To be fair, most people nowadays do order chicks from hatcheries, so the absence of tips on incubation and hatching is understandable, but that was the part I wanted to know about most. 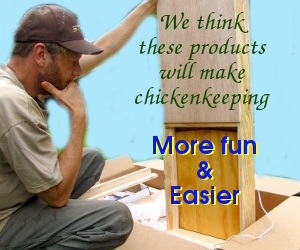 I would recommend Success With Baby Chicks to beginners planning to raise lots of chicks (perhaps to sell broilers or eggs) but probably not to the mainstream chicken-keeping public. That said, Robert Palmondon’s website (and his email list) are fonts of fascinating information and you should definitely check them out. His book is also very reasonably priced ($11.64 on Amazon), so it wouldn’t hurt to buy the book to support his work. French’s Chook Book, Day Range Poultry by Andy Lee, Feeding Poultry by Gustave Heuser, and — most intriguing of all — The Small Scale Poultry Flock by Harvey Ussery. The last is not yet published but is top of my list since I love everything Harvey Ussery has written. What chicken-related books have you read and enjoyed or plan to read soon?